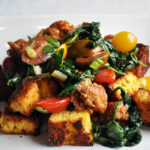 This cornbread salad starts with cubes of Jalapeño Cheddar Cornbread dried in the oven then tossed with Italian sausage, cherry tomatoes, and spinach in a quick vinaigrette. 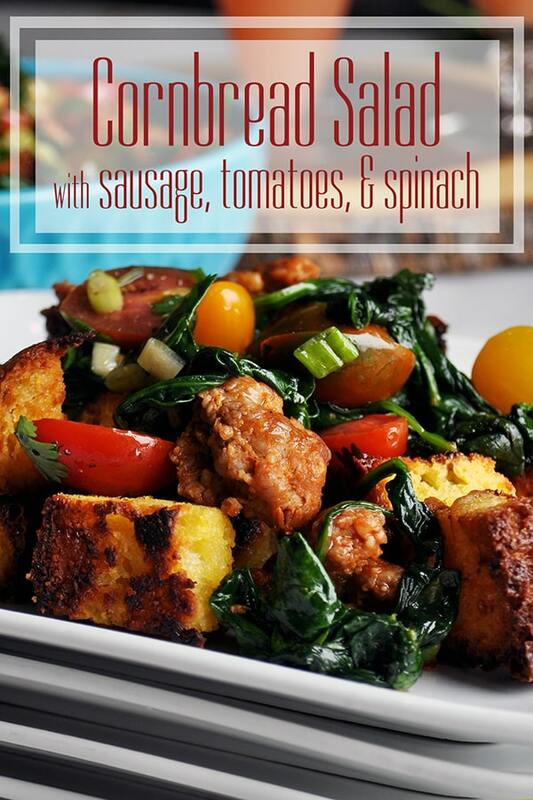 It is a surprisingly delicious and unique meal that the whole family will love, even the biggest skeptics. I almost didn’t create this recipe. I had some leftover Jalapeño Cheddar Cornbread​ hanging around and was thinking about how I might use it. 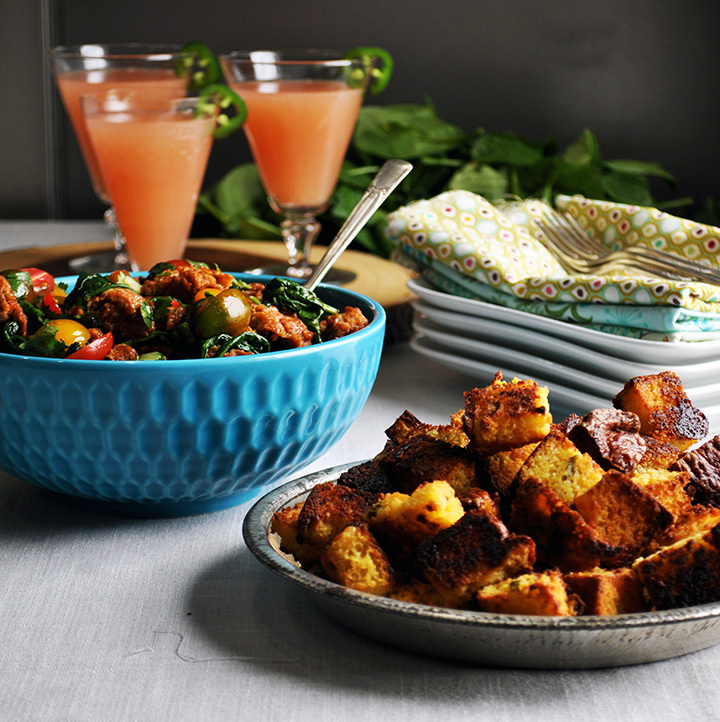 I had the idea to use it to create a version of Panzanella, an Italian bread salad that’s typically made with French or Italian bread and tomatoes tossed in a simple vinaigrette. But, the more I thought about it, the more I thought it probably wouldn’t work. 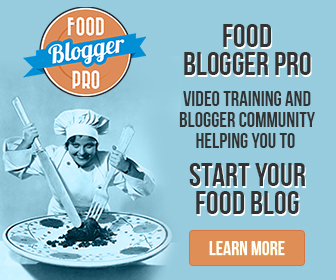 The only reason I gave it a go is because I had already purchased the other ingredients. And let me tell you. I am SO glad I did. 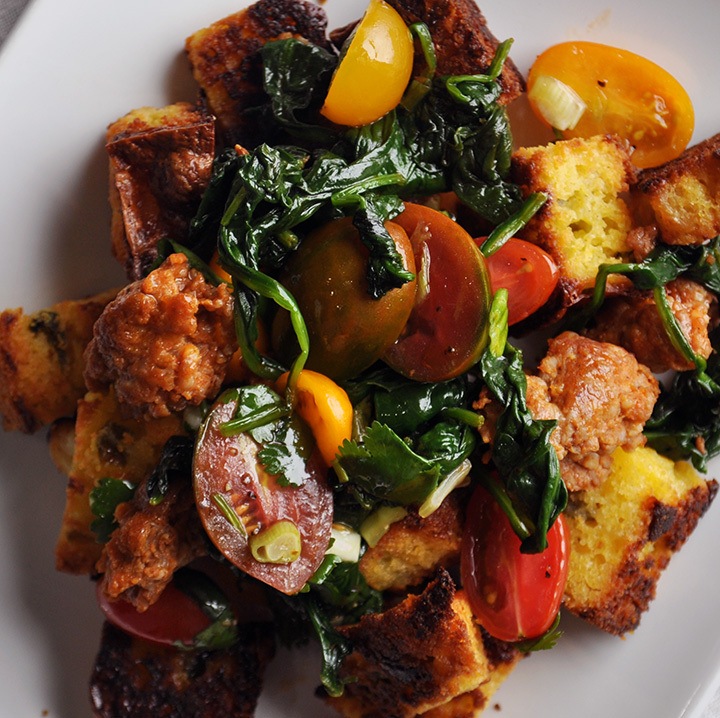 Panzanella is delicious in its own right, but this cornbread version really kicks it up a notch. The foundation of this salad is the Jalapeño Cheddar Cornbread​, giving it a cheesy, slightly spicy base. Since so much of cornbread salad is made up of, well, cornbread, it makes sense to use a super tasty version. If you’re making this as a part of Weekly Spring Meal Plan #2, you should have some leftover cornbread in your kitchen, reserved exactly for this salad. If not, I encourage you to make a batch a day or two before you plan to make this salad, reserving half the pan for this purpose. 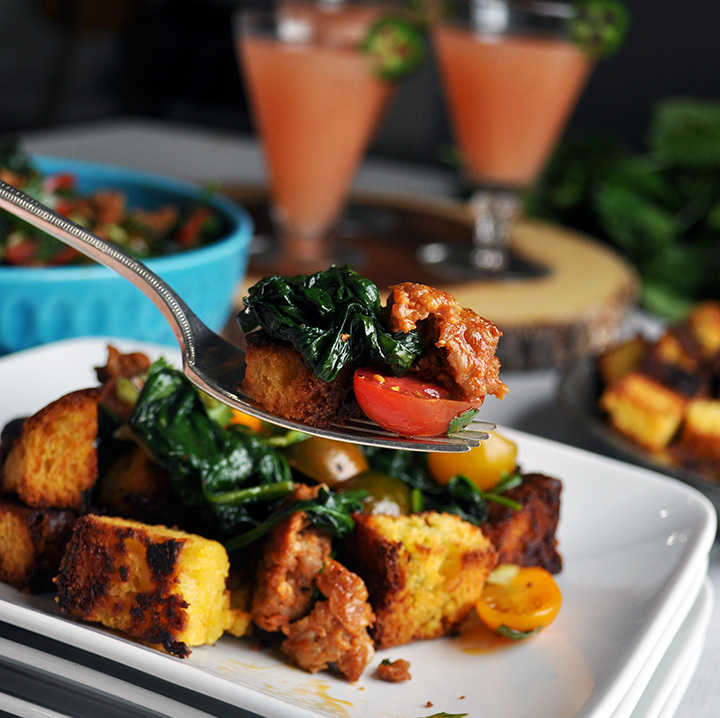 Alternately, you can use purchased cornbread from a local market or restaurant. Just try to get the most delicious, high-quality cornbread you can find. 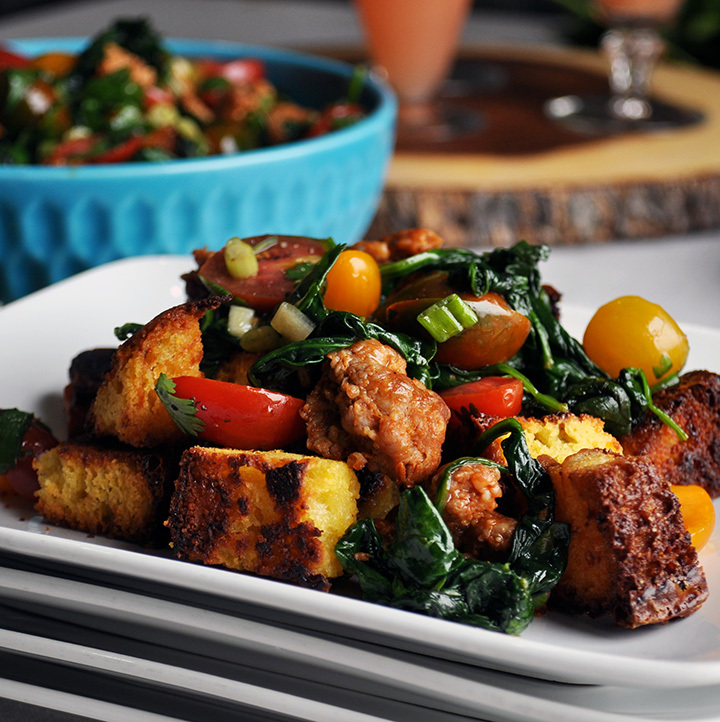 This cornbread salad is best served at room temperature. While the cornbread is in the oven, heat 1 tablespoon olive oil in a large skillet over medium heat. 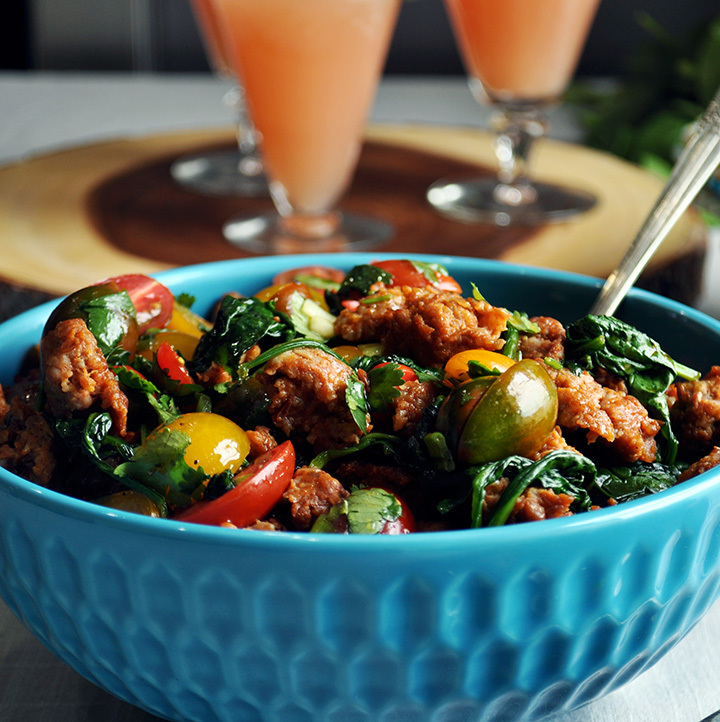 Crumble the Italian sausage into the pan and cook, stirring from time to time, until cooked through and none of the chunks of sausage are pink in the center. Add the spinach to the skillet along with the sausage. Let stand for a minute allow the bottom layer of spinach to wilt. Then gently toss with the sausage and cook for another minute or two until all of it is wilted. (If all 5 cups won’t fit at once, add half, allow it to wilt in the pan, then add the other half.) Dump the mixture onto a plate or a bowl and allow to cool slightly. 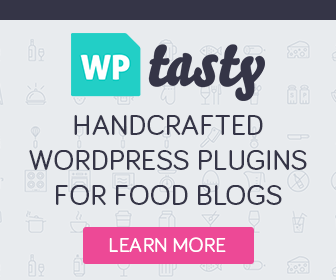 This salad is best served at room temperature.